Alpha - Star is a dry bright floor polish and sealer which when applied forms a protective transparent film on the surface protecting the floor from wear and tear due to continuos abrasive action. Alpha - Star is a durable polish especially when you need it most under traffic area. Can be applied on all types of hard floors, e.g. vinyl , linoleum , artifical and natural stone floor. Clean the area to be polished throughly with floor polish stripper. Remove slurry and apply damp mop to ensure 100% removal of dirt. 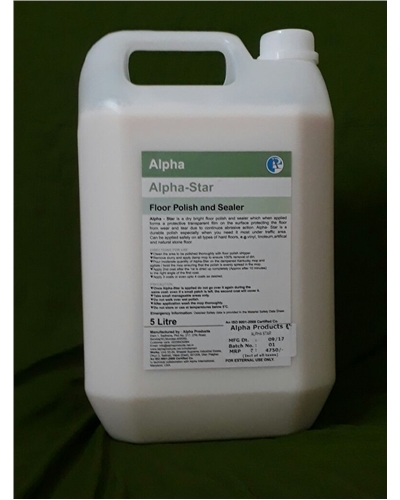 Pour moderate quantity of Alpha - Star on the dampened kentucky mop and agitate / twist the mop ensuring that the polish is evenly spread in the mop. Apply 2nd coat after the 1st is dried up completely (Approx after 10 minutes) to the right angle of the first coat. Apply 3 coats or even upto 4 coats as desired. Once Alpha - Star is applied do not go over it again during the same coat - even if a small patch is left the second coat will cover it. Take small manageable areas only. Do not walk over wet polish. After application wash the mop thoroughly. Safety Data is provided in the Material Safety Data Sheet.